Wow! Another year has come and gone … but not without plenty of adventure. The year 2018 was a very exciting one here at BirdTheRock – I was blessed beyond words to share the natural wonders of Newfoundland & Labrador with so many visitors, travel to amazing places both near and far, and experience countless special moments along the way. I have so much to tell … but as they say “a picture is worth a thousand words“, and maybe that’s the best way to share this long overdue summary of the year that was. Below are 18 images from 2018; chosen to represent just a fraction of the many, many highlights from my year. Winter is also the best time to enjoy the great numbers and diversity of gulls that St. John’s has to offer. I helped host a “Winter Gull Workshop” for NatureNL in February – and despite less than ideal weather, more than 50 participants showed up to learn and share our passion for birds! It was a lot of fun, and an exciting indicator that the love of birds & birding continues to grow in our province. The opportunity to travel and go birding in new places is one of the perks of being a tour leader — and this year was no exception. In May, I co-led an Eagle-Eye Tours trip in southern Ontario, visiting several “bucket-list” places along the way – Point Pelee, Long Point and Algonquin Park among them. It’s a fun and awe-inspiring way to experience the excitement of spring migration! The “Point Pelee & Algonquin” tour was also an opportunity to see LOTS of beautiful, often iconic, species — like this Prothonotary Warbler. These brilliant birds are scarce and very restricted breeders in Canada. While I’ve been lucky to see a couple in Newfoundland during fall migration and in the tropics during winter, it was especially rewarding to see them in their typical breeding habitat. Early June brought with it an opportunity to explore my province from a different perspective – on an expedition cruise around the island. I was invited to join the crew of the Hebridean Sky as it circumnavigated Newfoundland – visiting beautiful, quaint and often isolated communities along the way. June can still be a volatile time in the waters off northern Newfoundland – and this year was no exception. Arctic ice and rough weather toyed with our plans at every turn, but we didn’t let it stop our adventure! Here I’m standing on the arctic ice floe in the Start of Belle Isle, with Labrador (and our ship) in the background. I was honoured once again to lead several exciting trips for Eagle-Eye Tours — a total of four in 2018! The “Grand Newfoundland” tour is always a highlight of my year, and this year it was sold out – a testament to just how popular a birding destination our province is becoming. We had a great 12 days exploring the island and its array of landscapes, birds and other natural wonders … I’m already looking forward to doing it all again later this year! Nemesis down!! I’m always thrilled to help a client find a “target” bird when leading a tour, especially here in Newfoundland. However, it is extra exciting when that same bird is a target of my own. Northern Three-toed Woodpecker has been a so-called “nemesis bird” for me – one of just three breeding species on the island that have managed to elude me since I started birding ~18 years ago (the other two being American Woodcock and Northern Hawk Owl – both scarce and local breeders in the province that I just haven’t connected with yet). We found this male attending (or maybe just prospecting?) a potential nesting site while hiking a trail in Terra Nova National Park. I’m not sure who was more ecstatic – my guests or me! Another highlight of this trip is our visit to Grand Manan island and the wonderful birding there. I have a special fondness for seabirds, and the pelagic trip into the rich waters of the Bay of Fundy never disappoints. We has a gorgeous day for this year’s trip, encountering hundreds of shearwaters, storm-petrels, phalaropes and other pelagic species along the way – often right alongside the boat! In October, I was invited to join the team at Adventure Canada as their expedition ship “Ocean Endeavour” circumnavigated Newfoundland. It was an exciting opportunity to explore my home province from a unique perspective – often calling in to small, remote communities. I even got to see a few places I’d never been before, including Little Bay Islands (above) which neighbours my late grandfather’s childhood home. I was honoured to work with the incredible team at Adventure Canada, and to spend ten days with their fun and interesting guests … and I look forward to doing it again in the future. Sailing around Newfoundland also gave me a chance to get reacquainted with one of Newfoundland’s most enigmatic birds – Leach’s Storm-Petrel. These tiny seabirds nest in huge numbers along our coast, but usually stay far out at sea and out of sight (coming and going from their burrows only under cover of darkness). They are often attracted to the lights of ocean vessels, so it is not unusual to find them stranded on the decks during the night or early morning and in need of “rescue” (a gentle toss over the side to get them airborne). I was able to use this phenomena to educate guests and other staff not only about seabirds in general, but also the impact that our activities can have on them. After making some changes to reduce our light emissions, we saw a dramatic decrease (to nearly zero) in stranded birds during the course of our travels. The busyness of fall 2018 didn’t leave me with much time for birding on my own time (something I love to do in fall), but when I did I was thrilled to be joined by my oldest daughter, Emma. She seems to have caught the birding “bug” this year, and nothing could make me happier than see my kids connecting with nature. In this photo, Emma is “digiscoping” a Gray Heron in Renews – a mega rarity not only for Newfoundland, but all of North America. (Notably, Emma is using my trusty Kowa TSN-883 scope in this photo – for a detailed review of my Kowa optics check out this blog post from a few months ago). A personal highlight from Trinidad & Tobago 2018 was an encounter with four American Flamingos (lifers!). Somewhat unusual in recent years, these were part of a group that had been hanging out around the famous Caroni Swamp, and may have arrived from Venezuela following an earthquake earlier in the year. Although it’s been challenging to keep this blog updated during a busy 2018, I did post lots of updates on other social media channels (see above). These were my most popular Instagram photos throughout the year (note that not all photos were actually taken in 2018). Be sure to follow along for more stories and photos this year!! I know, I know … you don’t need to remind me. It’s been a while since I updated this blog. This summer was incredibly fun … and busy … and fun. Once again, I was privileged to share beautiful birds, nature, places and experiences with many visitors — from spectacular seabird colonies to quiet walks in the forest; from the rugged shores of Newfoundland to migration hot spots in the southernmost reaches of Ontario. Since the beginning of May I’ve led tours in three different provinces (Ontario, New Brunswick and Newfoundland), spent a week exploring our beautiful coast and isolated communities aboard an expedition cruise ship, and of course spent many days showing off the amazing birds, wildlife and scenery of my island home to dozens of BirdTheRock clients and guests. It’s a blessed life. In early June, I was invited to join the crew of the Hebridean Sky as it circumnavigated Newfoundland – visiting beautiful, quaint and often isolated communities along the way. June can still be a volatile time in the waters off northern Newfoundland – and this year was no exception. Arctic ice and rough weather toyed with our plans at every turn, but we didn’t let it stop our adventure! Here I’m standing on the arctic ice floe in the Strait of Belle Isle, with Labrador (and our ship) in the background. There were so many amazing birding experiences, it’s hard to choose even a few top highlights … but a close encounter with this Short-eared Owl has to be one of them. This magnificent bird circled around us just a few miles north of Cape St. Mary’s Ecological Reserve. What a looker! Speaking of Cape St. Mary’s — as always, this spectacular seabird reserve was a favourite with our guests. Words and photos cannot truly capture the awe that I experience every time I visit. If you’ve never been there (or even if you have! ), be sure to join me sometime. Our Summer 2019 schedule will be available soon. Nothing can prepare you for a visit to Newfoundland’s largest seabird colonies, and I never tire of seeing the look on my guests’ faces as they soak in the spectacle of Witless Bay Ecological Reserve. Hundreds of thousands of Atlantic Puffins, Common Murre, and many other seabirds swarm around us. The incredible numbers in the air and/or on the water is often just as amazing as the close-up views we enjoy while cruising past the islands. Of course, Newfoundland birding is not “just” about the seabirds. Our boreal forests are home to a diversity of birds, and we spent lots of time enjoying them this summer. Some, like this Wilson’s Warbler, only grace us for a few short months and are already heading south for another winter – while many others stay year-round to keep us company in the colder (but equally exciting) months. I was especially fortunate this year to co-lead an Eagle-Eye Tours trip in southern Ontario in early May. This tour is timed to coincide with peak songbird migration across the Great Lakes, and we visited migration hot spots such as Point Pelee, Rondeau and Long Point, as well as Algonquin Park. We encountered many migrants and a number of scarce/rare breeding birds in Canada — including several Prothonotary Warblers like this one. A very, very fun birding trip for everyone involved! Stayed tuned for more photos and updates. In the meantime, follow along on Twitter, Facebook and/or Instagram for regular photos. And … be sure to join me for an adventure real soon! Whoa … does time ever fly?!?! It’s hard to believe another year has come and gone … but not without lots of adventures. The year 2017 was a very exciting one here at BirdTheRock – I was blessed beyond words to share the natural wonders of Newfoundland & Labrador with so many visitors, travel to amazing places both near and far, and experience countless special moments along the way. I have so much to tell … but as they say “a picture is worth a thousand words“, and maybe that’s the best way to share this long overdue summary of the year that was. Below are 17 photos from 2017; chosen to represent just a fraction of the many, many highlights from my year. Like every year, 2017 started off with some excellent winter birding right here in eastern Newfoundland. I had the pleasure of sharing great winter birds such as Dovekie, Thick-billed Murre, White-winged Crossbill, Bohemian Waxwing, Boreal Chickadee and friendly Gray Jays with a number of visiting birders. This photo was taken during the annual WINGS Birding Tour – and you can read more about that in an earlier blog post here. I also joined Instagram this past winter – yet another great way to share photos and highlights with people from all over the world. THIS photo of a Dovekie (taken several winters ago) turned out to be my most popular photo of 2017 – not surprising given how much people tend to love these cute little seabirds! Newfoundland is the most reliable place in North America to see Dovekie and a big part of the reason why birders visit here in winter. I was honoured this year to earn the support of Kowa Optics, and upgraded my worn-out gear with their top quality equipment. I’ve had so much fun using this Prominar TSN-883 spotting scope and Genesis binoculars – and sharing the experience with so many of my guests. The optics are amazing! Stay tuned for an upcoming review of this Kowa swag here on the blog very soon. I returned home from Honduras to find Newfoundland in the cold, icy grip of the Arctic. Prolonged northerly winds were pushing Arctic pack ice much further south than usual – encasing the entire northern and eastern coasts, and even wrapping around to fill bays and coves in the southeast. While spring pack ice was a normal part of my childhood growing up on the northeast coast, it rarely reached this far south and some communities were seeing it for the first time in living memory. With the ice came lots of seals (including more northerly Hooded Seals), Polar Bears and even a very wayward Arctic Fox to far-flung places around the island. Birds were impacted too — ducks, loons and other seabirds were corralled into small sections of open water waiting for the ice to move off. The ice lingered so long on parts of the northeast coast that fisheries were delayed or even canceled, adding a very human aspect to this unusual event. Late winter and early spring can be a challenging time for birding – many of the winter species are beginning to move on, and migration has yet to start. But there are always wonderful things to see, and a mid-March excursion to Cape Race with one group of intrepid clients paid off with this — great looks at one of their “target” birds! This Willow Ptarmigan, sporting transitional plumage, allowed us to get up-close-and-personal right from the car! The pack ice may have receded as spring wore on, but other visitors from the north took their place. Newfoundland had an excellent iceberg season in 2017 – and one of the early highlights was this mammoth berg that perched itself in Ferryland (an hour south of St. John’s). Photos of this iceberg (including my own) went “viral”, showing up in newsfeeds, newspapers and TV newscasts all over the world. It was just one of many awesome bergs I saw this year … including with many of my clients! While there was no “huge” influx of European rarities into Newfoundland this spring, there was also no shortage. This European Golden Plover was one of several reported in early May. I was also fortunate to see a Ruff, two Eurasian Whimbrel, and two Common Ringed Plovers this year – AND happy to say that I had clients with me for each and every one! How’s that for good birding?!?! Of course, it’s not “always” just about the birds. During every tour or outing, I make time to stop and enjoy the abundance of other gems that nature has in store. I especially like the wild orchids of mid-summer, and this Showy Ladyslipper was one of nine species we encountered during a fantastic Massachusetts Audubon tour. What an awesome time we had! Of course, summer can’t be ALL work and no play! (Who am I kidding – my work is always fun!) I made sure to steal some time to explore both new places and old favourites with my family – including the rugged coastlines of Notre Dame Bay where I grew up and my passion for nature first took root! In August, I had the pleasure of once again leading the Eagle-Eye Tours trip to New Brunswick & Grand Manan. While there are many wonderful places and birding experiences on this tour, one key highlight is seeing the huge gathering of Semipalmated Sandpipers in the world-famous Bay of Fundy. More than 3/4 of the world’s population stop here during migration, and flocks of tens of thousands can often be found roosting on the narrow beach at high tide or swirling over the water. This was my third time leading this tour, and you can read more about it on an earlier blog post here. As summer fades to fall in Newfoundland, I often turn my attention to migration and the opportunity to find wayward and locally rare species right here on “the rock”. One of the most interesting birds was this very late empidonax flycatcher that showed up in November — well beyond the expected date of normal migrants and reason enough to scrutinize it. Originally found by crack birder Lancy Cheng, I arrived soon after and spent several hours trying to capture diagnostic photos amid the fleeting glimpses it gave. Based on photos from several birders and Lancy’s very important sound recording, this bird was eventually identified as Newfoundland’s first ever Willow Flycatcher! Chalk one up for the perseverance and cooperation of our local birding community! Winter also started off with a bang, when veteran birder Chris Brown discovered the province’s first Eared Grebe on December 1. Time for birding can be tough to come by for me at this busy time of year – but I managed to sneak in a “chase” to see this mega-rarity. Read more on my blog post here. My birding year ended on yet another high note: leading my third Eagle-Eye Tours adventure of the year – this time in Trinidad & Tobago! This was my second time leading this amazing tour, and I admit to being totally enamored with this beautiful place. The lush forests, open grasslands, intriguing coastlines … and, of course, the incredible birds and wildlife! This Guianan Trogon was just one of more than 200 species we encountered during the trip – many of which were equally stunning. Stay tuned for an upcoming blog post about my most recent trip — but in the meantime you can check out this three-part series from my last adventure in Trinidad & Tobago. And better yet – join me when I return at the end of 2018! What a fantastic year! Thanks to the many friends and visitors who shared all these special moments (and many more!) with me in 2017. I’m excited for 2018 and can’t imagine what wonderful experiences it might have in store! Why not join me to find out for yourself?!?! Wishing you all a happy, prosperous and fun-filled 2018!! Codroy Valley & Central Newfoundland – A Birding Excursion! Early June is a great time to enjoy birds in Newfoundland – and nowhere is that more true than the southwest coast. Not only is the Codroy Valley one of the island’s most beautiful places, it is also home to its greatest diversity of landbirds. A number of species wander there regularly that are otherwise very uncommon or rare in the rest of Newfoundland, and a few have pushed the limits of their breeding range to include this small region of our island. There are many species that you can expect to find here but nowhere else in Newfoundland! Bird⋅The⋅Rock just wrapped up its first Codroy Valley & Central Newfoundland Tour (June 1-6), where we enjoyed more than 100 species of birds and other wildlife, incredible scenery, and even some local events associated with the Feather & Folk Nature Festival. Leaving St. John’s, we spent one day/night in central Newfoundland along the way – taking in a short hike in Terra Nova National Park and some beautiful walking trails in Grand Falls-Windsor. We also made two visits to the unique estuary at Stephenville Crossing, and spent three full days exploring the mixed forests, wetlands, meadows, beaches and rugged coastlines of the Codroy Valley and surrounding areas. Below are just some of the many highlights … enjoy, and be sure to save the dates (first week of June) to join us for your own adventure in this beautiful part of the province! We spent a morning exploring the lovely Corduroy Brook Trails in Grand Falls-Windsor. Traversing a mix if habitats from wetlands to boreal and deciduous forests, we enjoyed a great variety of birds. Among the highlights were a number of Tennessee Warblers – an endearing little bird that was more abundant here than in later parts of the tour. We also enjoyed great looks and the interesting song of this Ovenbird, as it sang from open perches right above the trail. A short detour to Stephenville Crossing was very productive, and included several Black-headed Gulls. This European species has barely colonized North America, and this estuary is the only known place where it regularly breeds. They look stunning in their summer plumage! We also encountered this American Golden Plover. While a regular fall migrant, they are rare in spring and this was just the fourth spring record for the province! Documenting it required a walk across the wet, mucky mudflats. The view from our accommodations included not only the internationally recognized Great Codroy estuary, but also rolling fields, lush forests and the majestic Long Range Mountains (a northern extension of the Appalachians!). It was a treat to start and end each day with this beautiful vista. Gray Catbirds are one of those species that is very uncommon anywhere else in Newfoundland, but is often found in the southwest region. At least four individuals were found during our stay, including this one that was singing away on the Red Rocks Road. The mouth of the Grand Codroy estuary consists of a large, sandy barachois. Birding along both the inner and outer beaches can produce some great birds, as well as some great scenery. The sand dunes provide important nesting habitat for a variety of birds. Both Common (pictured above) and Arctic Terns nest along the barachois, and can cause quite a ruckus when a walker gets a little too close. The Piping Plover has experienced drastic population declines in recent decades, due mostly to habitat disturbance. Unfortunately, human activity on sandy beaches (and especially the use of ATVs on local beaches) has created a lot of problems for these little birds. Although numbers seem to be improving, they are still absent from much of their traditional range in Newfoundland. We were fortunate to encounter at least five individuals in the Codroy Valley – good vibes on so many levels! Just a few kilometres south, the Little Codroy River also flows into the sea at St. Andrew’s. The rich estuary, sandy banks and barren grasslands of this area provide a stunning foreground to the Long Range Mountains. We also spotted two Semipalmated Sandpipers on the beach one evening. This species does not breed in Newfoundland, and are rather unexpected in spring (though common during fall migration). A pair of Pied-billed Grebe surfaced from the grass in Loch Lomond – the only place in Newfoundland they have been known to breed. We saw another in a nearby pond, suggesting that this scarce species may still be breeding in this little pocket of the island. We saw several moose during the tour, including this young bull that was enjoying some tasty bog offerings. Another highlight was an early morning hike up the Starlite Trail. Under an open canopy of birch trees halfway up, we encountered several great birds. Both Veery and Least Flycatchers are scarce breeders in Newfoundland, and this location may be the most reliable place to find them on the island. Ovenbird are also common on these slopes – moreso than anywhere else in the valley region. A number of Least Flycatchers were “singing” here, and with a little patience we were able to get nice looks. We also bumped into this American Toad along the trail. Newfoundland has no native amphibians, but these were introduced several decades ago and are now widespread through much of the island. Chipping Sparrow is another species that seems at home in the Codroy Valley, but very uncommon in other parts of the island. We saw and heard several during our rounds, including this very photogenic one in a local camping area. Olive-sided Flycatchers have suffered significant population declines and are considered threatened in Newfoundland, as they are throughout most of their range. We encountered this one on our last evening in the valley – a great cap to our wonderful visit. We also took in several social and food events at the Feather & Folk Nature Festival. This festival, much like our tour, is scheduled to coincide with the end of migration and peak songbird season in the Codroy Valley (Photo from 2015). Stopping in at Stephenville Crossing on the way home, we found a single Willet foraging on the shoreline. Another scarce breeder on the island, this is one of its most regular haunts. We also enjoyed two Gray Jays, hopping around and catching insects in a small bog in a small bog. These birds are never short on entertainment! Spring rarely comes easy in Newfoundland … most years, it is an uphill battle as it struggles against “old man winter” trying to keep its icy/snowy/slushy grip on our island. This year was no exception, and we saw more total snowfall in April than in any other month this winter! But nature has a way of keeping its balance, and migration chugged on pretty much on schedule. A few mild interludes, and a relatively nice May, has certainly helped put a spring back in the step of most Newfoundlanders (especially the birders!). Feeling a little stir-crazy after weeks of “office” work, I was looking for an excuse to get out and experience a little spring for myself. So when Irish birders Niall Keough and Andrew Power asked if I could join them for a day of all-out birding in early May, I jumped on it. It was Andrew’s first visit to North America, and one of just a few for Niall — so there were lots of exciting things to look for and see. Heading south from St. John’s, we started with a female Purple Martin in Mobile – a local rarity that was only my third for island. A breeding plumaged Black-headed Gull was sitting on the rocks nearby – ho-hum for my friends, but always a treat to see on this side of the Atlantic. Roadside ponds offered a group of Ring-necked Ducks and a Beaver (which was especially exciting for Andrew). At La Manche we nailed one of the duo’s target species – a pair of Black-backed Woodpeckers acting very territorial. Several species of finch and both chickadees flitted around some cabins, and a Ruffed rouse drummed away in the forest cover. We soon found another local rarity – a subadult Franklin’s Gull dip-feeding in Cape Broyle harbour. Totally unexpected, and just my second for the province. This Purple Martin had been hanging around for several days – recorded less than annually in Newfoundland, but one of a number seen so far this spring. Black-headed Gulls are regular (though uncommon) in Newfoundland during winter, but it is always a treat to find one in spring sporting its fine breeding plumage. An even bigger treat was to find this Franklin’s Gull – a rare visitor to Newfoundland and totally unexpected. The long drive along Cape Race road was shrouded in fog and very quiet, but the one bird we did bump into was another big target – a pair of Willow Ptarmigan right alongside the road, giving awesome views! Similarly, a Snowy Owl lingering near the road in St. Shott’s was a great highlight, though it soon lifted off an disappeared in the thick fog. At St. Vincent’s beach we spotted more than a dozen Pomarine Jaegers battling the very high winds that had suddenly picked up, and then the biggest surprise of the day — a grey-phased Gyrfalcon coursing the beach. We watched it for several minutes before it disappeared over the seawall and never resurfaced (although I never managed to get my camera locked in it!). This male Willow Ptarmigan was very cooperative, even if the weather wasn’t. The female was spotted sitting on a rock just a few yards further up the road. The winds were suddenly VERY strong and blowing onshore when we arrived at St. Vincent’s beach – so maybe the dozen or so Pomarine Jaegers shouldn’t have been such a surprise. But seeing them from land in spring is pretty unusual. The final highlight was not a bid, but a marine mammal that neither of my Irish friends had even dreamed of seeing in Newfoundland – a young Beluga Whale that had been hanging out near the community wharf in Admiral’s Beach! We also saw two Manx Shearwater in the bay there, although they hardly garnered a second look as the guys fawned over the little whale. It was the start of a great marine adventure for these two – a couple days later they boarded the research vessel RV Celtic Explorer and sailed back to Ireland, seeing lots of other whales and seabirds along the way! This young Beluga Whale was easy to find at Admiral’s Beach, where it had been hanging out for several weeks. It turned out to be a huge highlight for my Irish friends, and an excellent end to an awesome day out in the wind & fog! This week is the beginning of a busy few months of birding and sharing Newfoundland’s amazing wildlife, nature and scenery with dozens of visitors … and I couldn’t be more excited!! Stay tuned for updates on a busy Bird⋅The⋅Rock summer! Codroy Valley – A New & Exciting Tour! It’s the middle of winter & a storm is wailing outside … What better time to start planning for SPRING?!?! Here’s a fresh and exciting birding tour to help you get started! 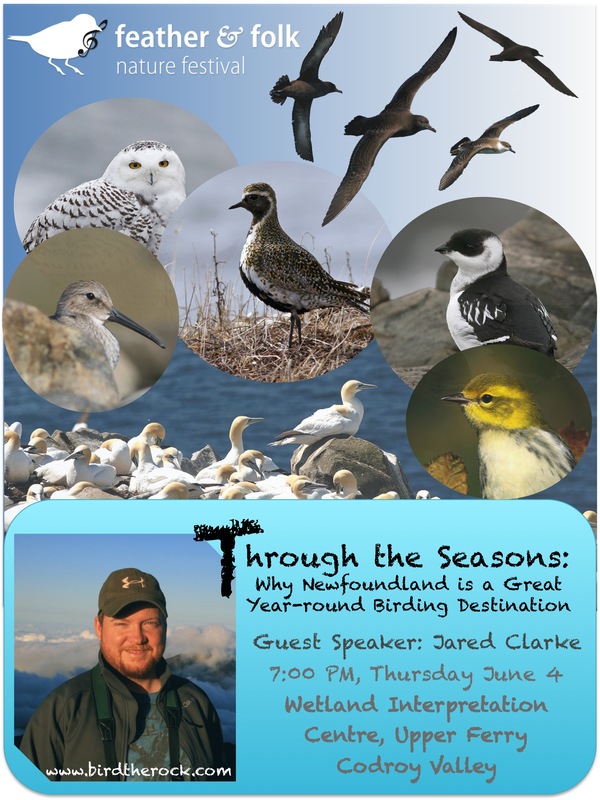 This tour is designed just as much for local Newfoundland birders as it is for visitors, and takes us to one of the richest and most beautiful birding locations our island has to offer! But register soon – spaces are limited!! Nestled away in the southwest corner of Newfoundland, the Codroy Valley is easily one of the island’s most beautiful places. Being much closer to the Maritime provinces both geographically (it’s a mere 150 km from Cape Breton) and ecologically, it is also home to the province’s greatest diversity of landbirds. A number of species wander there regularly that are otherwise very uncommon or rare in the rest of Newfoundland, and a few have pushed the limits of their breeding range to include this small region of our island. There are many species that you can expect to find here but nowhere else in Newfoundland! This tour will lead us through the Codroy Valley’s lush forests, sandy beaches, and rich estuaries – all while the beautiful Long Range Mountains loom in the distance. Our visit also coincides with the region’s Feather & Folk Nature Festival, and we will include time in our schedule to take in some of the social and educational events. Starting and ending in St. John’s, we will spend some time in beautiful central Newfoundland to enjoy local birds and break up our travel. If time and weather allow, we will also visit nearby Stephenville Crossing to seek out its unique habitats and bounty of birds. Leisurely birding in some of Newfoundland’s most scenic locations. A variety of settings that include forests, wetlands, and seaside habitats. An opportunity to enjoy Newfoundland’s richest diversity of songbirds, many of which have just arrived and provide a tremendous morning chorus. Several of the provinces “species at risk”, including the endangered Piping Plover and some of the island’s last remaining Bobolink. A number of “Codroy Valley specialties” – uncommon birds that might include several colourful warblers, vireos, and flycatchers among others. Opportunities to meet local birders and participate in Feather & Folk Nature Festival events. * A typical day will include an early morning start. Birding will be at a leisurely pace and may require short walks (up to several kilometers) that will be done very slowly. A more arduous, uphill hike may be offered as an optional outing. * Weather is generally nice but cool in early June (especially in the mornings), so participants should pack accordingly … layering works. Waterproof coat and boots are advisable. We may continue to go birding outside in light showers, but plan for alternative birding or activities in more challenging weather. * Each evening, a list of the birds and other wildlife encountered will be reviewed and discussed. * Accommodations will include shared two-bedroom cabins in Codroy Valley (4 nights) and double-occupancy hotel rooms in central Newfoundland (2 nights). * See single occupancy supplement below regarding one-bedroom cabins and private hotel rooms. Day 1 (June 1): Our tour begins at noon as we depart St. John’s and head west across the TransCanada Highway, arriving in central Newfoundland for the evening. We will make some brief birding stops along the way and/or take an evening bird stroll. Overnight: Central Newfoundland (exact location TBD). Day 7 (June 7): After a morning birding in central Newfoundland, we will head back to St. John’s for a mid-afternoon arrival. Transportation throughout the tour, starting and ending in St. John’s (we can make alternate arrangements if you require pick-up at another point between). Evening meals (you may choose to dine separately or as a group; cabins in Codroy Valley will include kitchenette and BBQ if desired). Contact Bird⋅The⋅Rock for more information or to REGISTER FOR THIS TOUR now! I recently received an invitation to participate in the Feather & Folk Nature Festival. Saying “Yes” was a pretty easy decision … not only do I enjoy sharing my love of birds and birding with others, but this festival is located in one of my favourite places on the island. 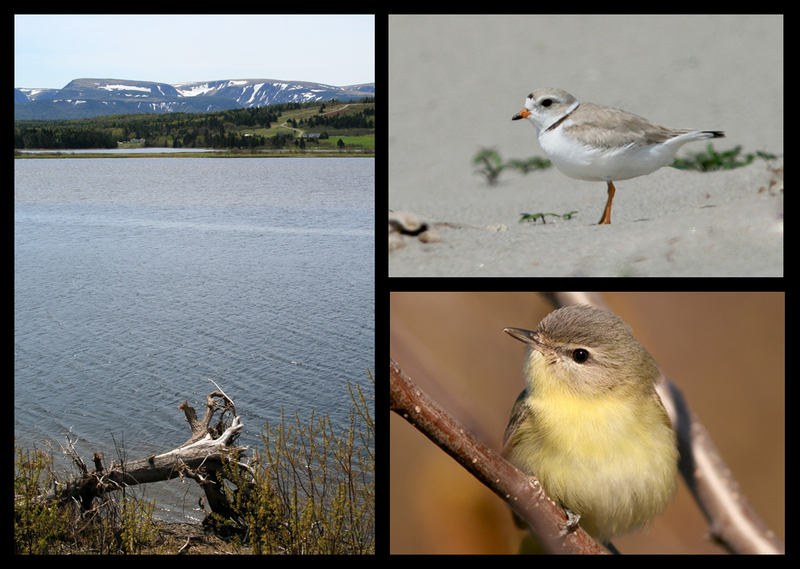 The Codroy Valley, located in SW Newfoundland, is home to the largest diversity of songbirds in the province, the only known breeding population of Great Blue Herons, endangered Piping Plovers, scads of waterfowl, and many other gems. All in some of the most scenic setting around … lush forests, sandy beaches, rich estuaries, and the beautiful Long Range Mountains looming in the distance. It is a delight to go birding there in spring – something I haven’t been able to do a for a few years now. I’m itching to get back, and looking forward to a great few days of birding and socializing! Check out the festival website for a full slate of activities – from guided bird walks to photography lessons, and kitchen parties to art exhibits. It’s going to be a great time!